I’m a newbie to the programming world. I first started programming in Python in May this year, a month after I started this blog, so I still haven’t learnt enough to contribute to economics as is the stated goal of this blog. But I know I’ll get there in a year or less. This blog was also meant to document my learning. In May, I would have called myself Newb v0.0. Today, 3 months later, I’d like to call myself Newb v0.3 and the goal is to be at least Expert v1.0 by January 2016. 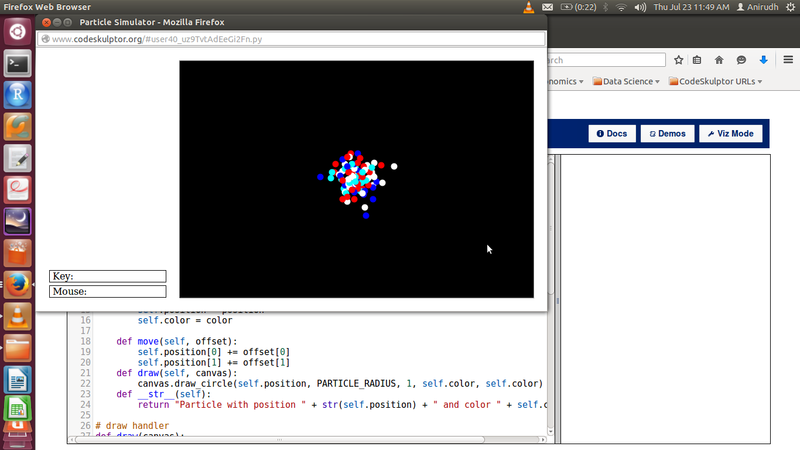 With the help of Rice University’s awesome classes on Python programming I created a cool simulation of particles diffusing into space, using the concept of Classes, which I learnt just yesterday! Click to check out the code ! I’m teaching my algorithmic game theory course at Stanford this quarter, and this time around I’m posting lecture videos and notes. The videos are a static shot of my blackboard lectures, not MOOC-style videos. The course home page is here. Week 1 videos and notes, covering several motivating examples and some mechanism design basics, are already available. This week (Week 2) we’ll prove the correspondence between monotone and implementable allocation rules in single-parameter environments, and introduce algorithmic mechanism design via Knapsack auctions. The ten-week course has roughly four weeks of lectures on mechanism design, three weeks on the inefficiency of equilibria (e.g., the price of anarchy), and three weeks on algorithms for and the complexity of learning and computing equilibria. Periodically, I’ll post updates on the course content in this space. I would be very happy to receive comments, corrections, and criticisms on the course organization and content.